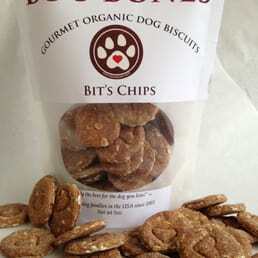 A small biscuit but a big-time favorite — a great choice for trainers, puppy owners, dog walkers, small dog lovers. Bit’s Chips are smaller biscuits, about the size of a quarter. They contain organic whole wheat bread flour, organic rolled oats, eggs from free-range chickens, award-winning honey, and spring water.